There are numerous tennis courts within the area, mostly attached to residential developments, and some allow non-residents to hire for a small fee. 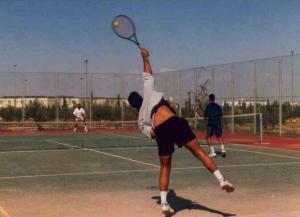 There are also plenty of council-owned and private leisure facilities that include tennis courts. Please view our Tennis page for further details. There are quite a few Go-Kart racing tracks located within most resorts. They are primarily well-run and include other facilities on-site - such as children's track (with tiny two-stroke engines), viewing granstand, bar, restaurant etc, and plenty of parking . Summer winds are mostly thermals, coming up around midday, peaking between 4 and 6 in the afternoon and dying away in the evening. The mornings are usually very calm but occasionally Summer storms blow for several days from the East or Southwest providing excellent conditions for experienced sailors in all areas. Under normal conditions the thermals off Calpe, Moraira and Javea beaches seldom exceed force 4 with around 2.5 being the average. Hiring facilities are available in most resorts, and windsurfing schools offering professional tuition. Kayaking along the coastline can be experienced either on a guided tour following a trained instructor or by renting kayaks. The local "Hot-shots" load up their cars and head for VERGEL where the Monte Pego mountains induce thermals practically every day in excess of force 4 and, on a good day literally hundreds of surfers will be out. 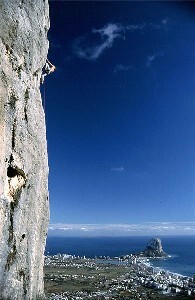 The Costa Blanca has become the largest and most popular area in Spain for visiting climbers. The wealth and variety of climbing in the area is truly staggering, and for every partially developed crag there are at least two other slightly less accessible ones which haven't been touched yet. But it is the variety in the climbing which keeps people coming back here. It is not just roadside clip-ups since there are huge trad routes on the Puig Campana, and in the Echo Valley, and majestic, fully-bolted, multi-pitch extravaganzas on places like the Peñon and the Ponoch. You can switch from doing one long route in the mountains on one day to ticking a dozen routes on a crag three minutes from the car on the next. In the Costa Blanca the weather and general holiday atmosphere which are also part of the attraction. There is something uniquely appealing about climbing a route on Christmas Day, on a superb cliff in the blazing sunshine, while staying in an apartment in a nearly-deserted Benidorm or Calpe and relaxing afterwards with a few beers on the beach. The routes cover all grades and styles with probably the widest choice of lower-grade Winter-Sun-Rock available in Spain. But there is also lots of hard stuff, adventurous stuff and esoteric stuff. If you explore the area a bit, you will be rewarded. More information on rock climbing in the area. To read our Blog on Rock Climbing. Available to hire in most resorts.These are noisy and exciting but its quickly over. They are available for rent in most resorts. The modern ones actually circle back to get you if you fall off and the older ones just stop (no, you don't have to catch them!). These are available in Calpe. They take groups out to a raft for a 15 minute ski or flight around the beach and boats can be hired in Javea (in the canal alongside the Arenal Beach) fully equipped for skiing. The rocky headlands and bays offer excellent sub-aqua sport for the snorkel or scuba-diver. Dive centre Scuba Moraira - Ctra. Moraira-Calpe, 130, Moraira. 03724 Tel/Fax :(0034) 96 649 2006. Scuba diving in Moraira, Javea, Calpe, blanca with scuba moraira. Scuba Moraira dive centre is situated on the moraira coastline, with their boat moored in Moraira port. They dive 3 times a day, with dive sites along the coast. The Spanish Mediterranean coast, on the whole, has been "plundered" for years by the commercial fisherman. Fortunately now this is better controlled and there can be some quite good sport with bass and conger for the beachcaster, especially at night. There are some quite good Grey Mullet particularly in Calpe harbour and in Javea the fishermen allow anglers to fish off their moored boats in the evening. Fishing is prohibited in Moraira marina. The interior of Spain boasts a wealth of waterways, mainly mountain rivers and streams and gigantic reservoirs. There is some very good sport for the trout angler but the best fisheries are controlled and day permits are required. All of the reservoirs contain the coarse species Carp, Tench, Barbel, Black Bass, Zander, Pike, Eels, Golden Orfe and Koi Carp. Locally the reservoirs of Villajoyosa (30 mins drive), Guadalest (1 hour) and Beniarres (1 1/2 hours) offer reasonable carp fishing with specimens up to 30 lbs but with the average fish being about 4 lbs. Additionally Villajoyosa abounds with Orfe and Koi Carp - imagine a keepnet full of such colours! The two rivers of the Pego Marshes (3/4 hour) contain carp to 15lbs, barbel, black bass and the occasional sea bass. Unfortunately the locals have constructed "puestos" (-platforms) in the best swims and visitors are not allowed to use them. Please note that a permit is required for fresh water fishing for each autonomous region but the cost is only 1,500 pts for a full year. All that is required is your signature on the form and a photocopy of your passport. Licences can be obtained by any gestor but take about a week to arrive. You can go to the offices of the water authority in Alicante yourself and obtain one immediately or make prior arrangements via your Tour Operator or Rental Agency. The penalty for being caught is a stiff fine and confiscation of all tackle.